ECX - Automodello AMP Monster Truck Built-To-Drive 2WD 1:10 Kit. Le versioni kit sono state un pilastro importante del settore del modellismo RC sin dall'inizio. Montando un kit, il pilota riesce a conoscere la sua macchina nel dettaglio e puo' aggiungere un tocco personale alla macchina. Il marchio ECX porta avanti questa bellissima tradizione, presentando l'ECX AMP MT. La versione kit Build-To-Drive include attrezzi, trasmittente e la motorizzazione. Una volta assemblato il modello, potete mettere alla prova la macchina, conquistando i terreni piu' difficili. Get your hands dirty with the ECX AMP MT Build-To-Drive Kit. Build-To-Drive kits give new builders the advantage with tools, transmitter, and power systems all included as well as pre-assembled shocks, differential, and wheels. Get your hands dirty then bash the competition with the ECX AMP MT Build-To-Drive Kit. Kits have been a mainstay of the RC hobby since the beginning. Putting together a kit helps educate drivers on their ride and gives them the opportunity to add unique tweaks along the way. 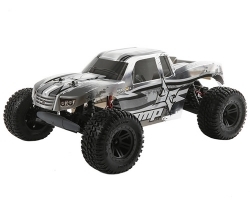 First time building an RC Kit? No Problem. Build-To-Drive kits give new builders the advantage with tools, transmitter, and power systems all included as well as pre-assembled shocks, differential, and wheels. All you need to do is follow the instructions, and you'll be ready to bash and dash in no time. When assembled, the AMP MT is nearly unstoppable and features the hard-hitting durability that put the ECX brand on the map.